I like the commentary in this blog regarding how the contents of said bloggers refrigerator depict a bleak portrait of decrepit single-life. 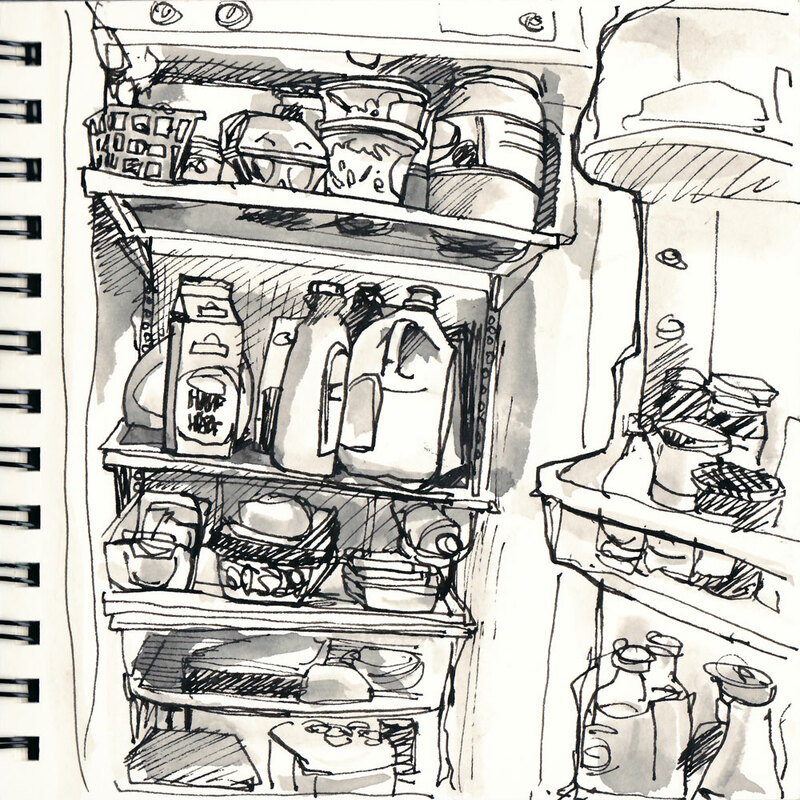 I spent much of the early part of my career as a consumer anthropologist working in the consumer package good space, with endless hours engaged in scrutinizing the contents of different household refrigerators: seeking context for grocery purchase-decision-making behavior. It’s a habit I still hold on I and have used (in addition to pantry and bathroom drawer / medicine cabinet-audits) as a dating litmus-test as well as to gain a better understanding of my friends / family / etc. You can learn an awful lot about a person’s socioeconomic status, priorities, habits and lifestyle choices based in their “consumable” artifacts: all organic veggies? Condiments-only? Name brand booze but generic food items? In often catch myself in the checkout line making up stories about the person in front of me in line based on what’s in their belt. It makes me wonder what people might think of me. Last grocery order : Cottonelle toilet paper with aloe, organic yogurt, egg whites, coconut ice cream, razors and salt and vinegar pop chips…the analysis please? There’re few things as depressing as a bare fridge. It’s the cliché of the single person you always see in movies: a few moldy Chinese takeout containers, a half-empty jar of mayonnaise, a box of baking soda, a six-pack. But shopping for one is tricky. These days, I do tend to eat at home and to cook more than I did when I had a teenaged roommate. But I have to be careful not to be too ambitious and to fill my kitchen with stuff I’ll never have time to eat. I hate throwing out stuff that survived past its due date: a head of cauliflower, a half-gallon of milk, some cheddar that’s turning into bleu cheese. Still, I’d rather waste food than face an empty larder.